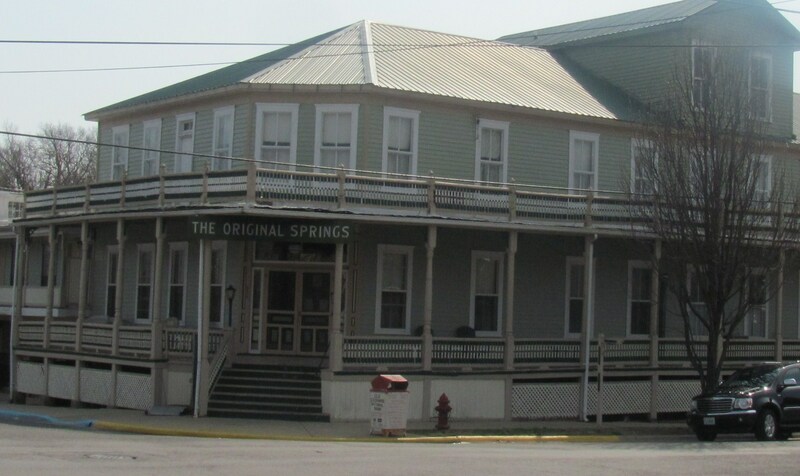 So once again my children's Spring break has rolled around and we loaded up the van and headed to the glorious and haunted Original Springs ...a hotel that still uses "real metal keys"! Last year we were graciously allowed access to the Bath house after closing hours, however this time we were aware that another group had booked Saturday night for their paranormal expedition. We were not really sure what to expect. On Saturday afternoon, while our CAPS team was chatting on the sun drenched front porch we happened to meet Cindy. She and her son (James, whom we met later) were there with the other paranormal group. We, of course, exchanged business cards and experiences like all paranormal investigators. They are with an organization called "snapit" ( SuperNatural and Paranormal Investigation Team) http://www.snapit-ghost.com/Members.html She also told us more about the founder of the Chicago Paranormal Research Institute, Ursula Kalin, that had put the trip together. (www.ursulakalin.com) Almost as though she knew we were talking about her, Ursula appeared on the porch and introduced herself. She impressed us greatly with her abilities, but mostly the charm she exuded. Dave and Trish had booked room #350, a suite that is supposed to be one of the most haunted areas in the hotel. When Dave and Trish first arrived they discovered the alarm clock in the bedroom was alarming. Dave immediately turned on his recorder and began asking if there was something special about the time 2 o'clock or 1 o'clock? For some reason I decided to make a little joke about "perhaps a hangin' at noon"? Ursula and the Staff were very grateful that Dave and Trish allowed the entourage to do a walk-through of their room during the tour, and because of our courtesy, we were allowed to join the rest of their tour. It was then that we learned a man named Tom Rodgers had hanged himself in that very room. It made me regret my Hangin' joke from earlier. When we joined them in the Bath House, it was very noisy in sections. In one area a couple of young ladies were singing very loudly. We didn't know if they were trying to appease the spirits or provoke them, but from what we were hearing, it was probably the latter. While we were there last time, we caught an EVP of a male voice saying "Warrick". At one point, Dave thought he heard a male voice right next to him and thought he said, "Warrick". Unfortunately it did not come through on his recorder. After I dropped off some of my equipment, we all went back to room 350. During our vigilant there, I thought I saw a shadow pass by the front door and shortly after there were some sounds we couldn't explain. Several times we heard noises emitting from different areas of the room, but could never find a direct cause. We did get some interesting EVPs and caught a couple of strange orb anomalies on a night vision video recorder. We decided to wrap things up around 3am. Trish walked with me halfway to my room where we ran into James and Ursula heading up to meet Cindy on the third floor. They were anxious to get in a lot more investigating. I believe they had a lady in white sighting in the Bath House during the wee early hours. Once again, the Original Springs staff showed us a fabulous time. We met some wonderful people, and this CAPS girl highly recommends a visit to the spa for a mineral bath and a relaxing massage. Also a special thanks to Amanda for the splendid hotel tour she gave consisting of tales relating to the past occupants and the present "spirited" dwellers that are said to still reside within the walls of this historic structure! These clips were captured in one of the first floor rooms in the newest section of the hotel. Although CAPS is not necessarily convinced of the paranormal nature of these anomalies, we found these two most intriguing. This was captured in Room 350. Listen for the male voice as Trish is asking a question. This "Sing-Songy" voice was also captured in room 350. This one was taken during our tour of the bathhouse. While Trish is speaking, sounds like a lady saying, "I'm a Pearson"